The Moore family and Maggie – C.S.P.C.A. Maggie came to live with us a few years back. On the day I went to find a dog this little dog had been returned to the pound following re-homing as not suitable. She is so cute I had to take her. We named her Maggie as she is black and white like a Magpie. Maggie had been rescued from a container and was not used to being outside. Her paws were so soft and it took her a while to get used to open spaces and being outside. Maggie was very quiet to start off with… but with lots of love and affection Maggie soon settled in and became more confident in her self and is now a proud member of our family. 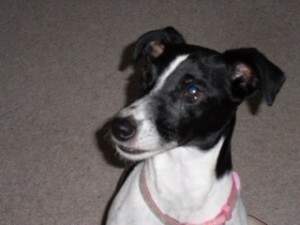 It turns out that Maggie is very intelligent and was very quick to learn and was very easy to train. The kids love her so much and Maggie returns her love by loving to play dress up !! Maggie even has her own Facebook page. Maggie has now made us so proud as she is a member of Irish Therapy Dogs and visits patients on a weekly basis where she brings so much joy. She is so calm and affectionate and has brought so much joy to us all. Maggie loves to travel and has been on many trips all over Ireland. 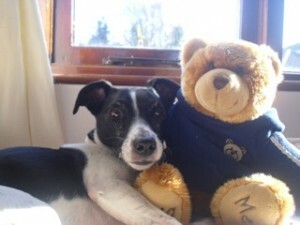 We can only thank the CSPCA for Maggie. I would urge anyone looking for a dog to visit the pound in Mahon to find a companion for life.